At their usual street price of around $30, Panasonic RP-HTX7 Monitor headphones are simply one of the best values going for a full-size headphone. Retro-styled headphones are all the rage these days. Just check out your local hipster fashion locale such as Urban Outfitters, where you’ll find youth-oriented brands like WESC and Urban Ears offering old-school looking cans by the truckload. And with prices ranging anywhere from $30 to $70, consumers can afford more than one pair. Apparently that hipness factor isn’t lost on traditional consumer electronics companies, either: Panasonic offers its own set of low-priced retro cans, the RP-HTX7 Monitor headphones. While they carry an MSRP of around $70, they can be found from many retailers for a lot less, usually around $30. Unlike many of the competitors they’ll share shelf space with, they also have the pedigree of an established consumer electronics brand. Do they sound as good as they look? We put them to the test. Panasonic’s RP-HTX7 came in an easy-to-open, clear plastic display box with graphic cardboard inserts; no scissors or garden shears are required for getting to these cans. 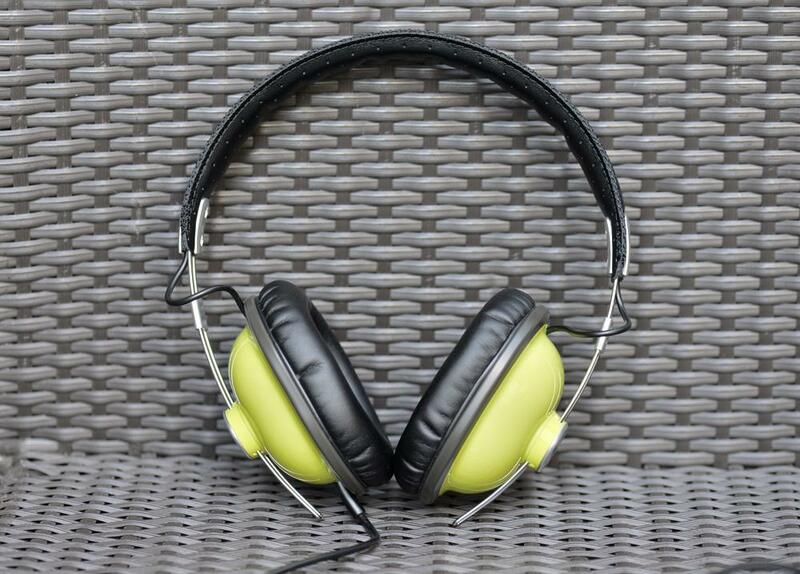 Once we pulled out the headphones, we were impressed with their smooth ‘n glossy, lime-green earcups, well-cushioned ear pads, and overall durable design. We were a bit bummed by the lack of a quarter-inch adapter, carrying bag, or any accessories to speak of. But seeing as how the cool kids like to wear their headphones around their necks and use them with their mobile phones most of the time anyway, we doubt the lack of accessories will be much of an issue for Panasonic’s targeted demographic. 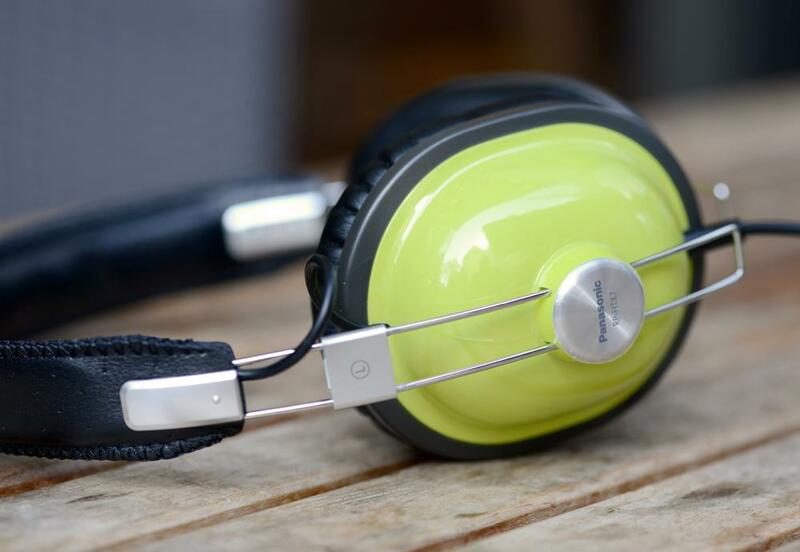 Panasonic makes RP-HTX7 in a dizzying array of unmistakably vintage colors, with the end of the model number denoting the shade – our lime-green cans were marked RP-HTX7-G1. Their circumaural, closed-back design keeps sound in, making them fit for public transport travel or commuting. Both the earcup cushions and headband are wrapped in a material that’s decidedly more vinyl-like than leather-like. While the headband features minimal padding on its underside, the earcups have enough of it for a comfortable fit. Those earcups also slide along metal bands for a good amount of fit and tilt adjustment, but no swivel feature is provided. 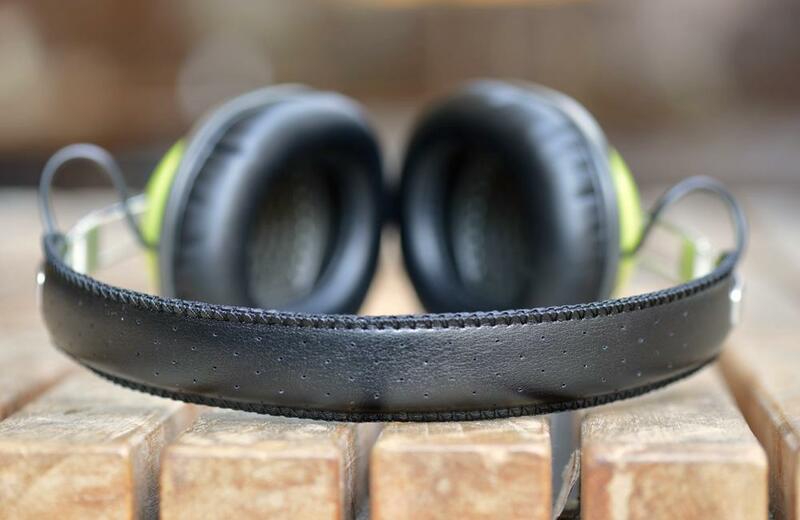 Other features include a thick, single-sided, 3.5mm cord, 40mm drivers with neodymium magnets, and an overall lightweight design. 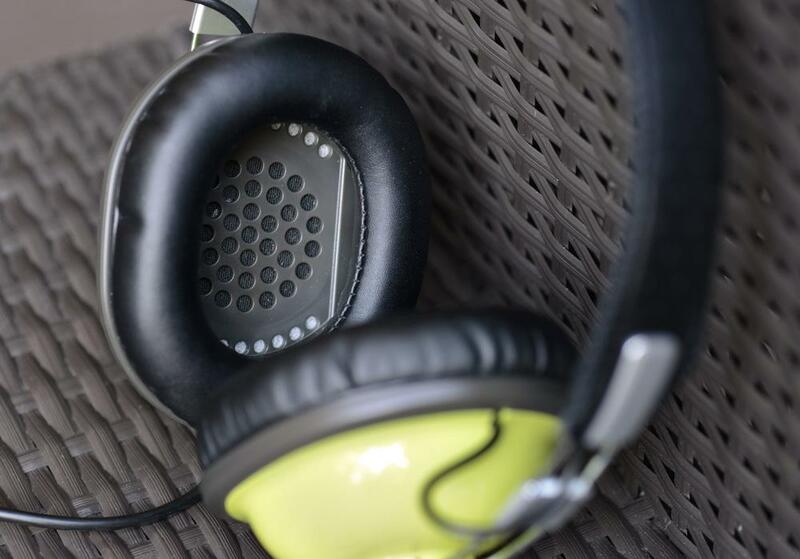 We used the Panasonics the way we figured most folks purchasing headphones in this price range would: straight from the headphone outputs of an iPhone 4, iPod shuffle, and Dell Latitude D810 laptop. We also kept handy hand several pairs of headphones for comparison, including the Bowers and Wilkins P5, Sennheiser MM 500-X, and Phonak Audeo PFE122. As soon as we started listening to the RP-HTX7, we enjoyed what we heard. If there’s one word that best describes the way the Panasonics made music, it would simply be “fun.” We tried them out with all different kinds of music, including hip hop, bluegrass, classical, electronica, grunge rock, and big band, and regardless of the musical genre, the RP-HTX7 made everything sound easy-going and fun to listen to, allowing us to just kick back, forget about the sound quality and enjoy the music. When we did focus on the sonics, we noticed that the Panasonic RP-HTX7 had a big, full and warm sound, with a slight emphasis on the midbass. Music that was already generous in this area, such as the album Villa Manifesto from Slum Village, could sometimes sound a little too boomy, but it never thumped its way into a one-note drone and still had decent pitch definition and clarity. The RP-HTX7 also possessed a fairly cohesive and smooth treble overall for such a low-priced headphone. Higher-pitched instruments, such as the various cymbals, bells, and triangles heard on that electronica classic The K&D Sessions from Kruder & Dorfmeister, had good presence, even if they did seem slightly subdued. While the Panasonics couldn’t reproduce timbral resolution and inner detail the way much more expensive headphones could, what sonic information they did serve up still sounded fundamentally correct and was always easy on the ears. Perhaps the Panasonic’s most noticeable shortcomings lay in the midrange. The RP-HTX7 lacked fullness through this region and consequently lost some detail and tonal development. Sounds such as male vocals, piano, and trumpet all seemed just a little too thin through the Panasonic cans, and layered instruments in more complex recordings didn’t ring with as much clarity and presence as they could. Still, the RP-HTX7 always managed to turn in a fun, easy-to-listen-to performance song after song, album after album. The Panasonics also had a comfortable, secure fit and always felt light on our head. Even after rockin’ out with them for more than two hours straight of some early ‘90’s, torture-test grunge, the RP-HTX7 stayed put, and we never felt any undue head pressure. Sure, given enough time, they could occasionally turn into miniature ovens, but that’s to be expected from any sealed and closed-back set of cans. As should also be expected of a sealed design, the Panasonic RP-HTX7 had pretty decent noise isolation overall and were better than average in this regard. While they didn’t completely seal out ambient sounds, what did come through was fairly benign in nature. Perhaps more importantly for some users, the Panasonics did good job of keeping the music from leaking out of them, even as we went Insane in the Brain with some old school Cypress Hill turned up to 11. We were pleasantly surprised by performance of the Panasonic RP-HTX7. What sonic deficiencies they do have are mostly sins of omission: They artfully shave off bits of sound quality here and there while never committing any serious errors, presenting an overall well-balanced sound. They always turned in a big, full and enjoyable performance and made listening to music sheer fun — a seemingly simple task that eludes much of the considerably more expensive competition. And if you can’t decide which finish you like best, you could always buy two sets of ‘em — heck, they’re certainly cheap enough. Bottom line: At their usual street price of around $30, Panasonic RP-HTX7 Monitor headphones are simply one of the best values going for a full-size headphone.